A major rift has opened up between Germany and France for the first time in 30 months of euro crisis over how to restore confidence in the single currency. A special EU summit marking the debut of France's President François Hollande saw him challenge Germany's chancellor, Angela Merkel, on the euro, arguing that the pooling of eurozone debt liability – eurobonds– had to be retained as an option for saving the currency. 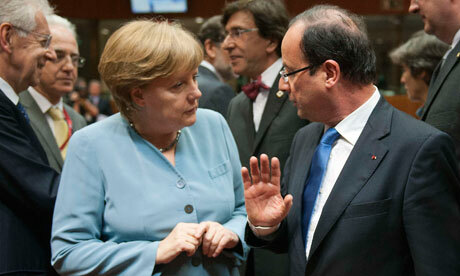 Merkel has ruled out eurobonds as illegal under current EU law. Hollande told the dinner of 27 leaders that he wanted to see eurobonds established, while conceding that this would take time, witnesses at the talks said. Merkel responded that this was nigh-on impossible since it would require changes to the German constitution and around 10 separate legal changes, the sources said. There was no policy breakthrough at the summit, rather a reiteration by leaders of known positions. Any decisions were postponed until the end of next month after French and Greek parliamentary elections on 17 June. The fissure between Paris and Berlin widened further when Hollande also called earlier for the eurozone's new bailout vehicle to be allowed to draw funds from the European Central Bank and to be able to recapitalise banks directly, both proposals fiercely resisted by Berlin and also currently impossible under EU law.